Last Saturday, one of the vendors at the farmers’ market had fresh blackened peas. They are not grown much around here, and I was delighted to find them. I bought enough for a good mess and even got them shelled that evening! The menu kept on growing… There should be some greens on the plate, and there was Tuscan kale in the refrigerator. I didn’t want a whole pan of corn bread tempting me, so I made a small batch of polenta or should I call it corn meal mush on a southern influenced menu? I have to have seasoning in my blackened peas. I like a ham bone or sometimes thick sliced bacon. This time salt pork was the choice. I sliced and diced some for the pot and then I cut a few thick slices, removed the skin from them and fried them in their own rendered fat. Just a couple of bites per slice and two slices per serving were only slightly lethal, I’m sure. It plated up nicely and made a southern boy happy the way only comfort food can… and it became a Mostly Meatless Monday all because of what had to go with the fried green tomatoes. 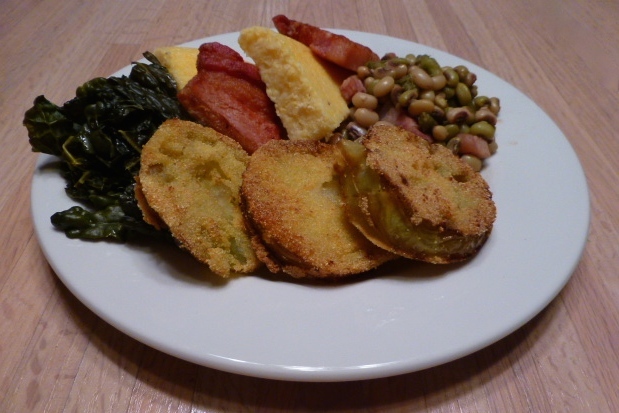 Fried green tomatoes, kale, polenta, salt pork and blackeyed peas on a Mostly Meatless Monday. chopped fresh chives for garnish. Grate 2 ears of corn on the large holes of a box grater over a medium bowl. Catch as much juice as possible; set aside. Cut kernels from the third ear of corn into another medium bowl; set aside. Bring broth, milk and water to a boil in a medium sauce pan. Reduce to a simmer and slowly stir in grits. Whisk often as they cook for 20 – 25 minutes. After about 15 minutes, mix in grated grits and butter and continue cooking at a simmer; season with salt and pepper. After adding grated corn and butter to the grits, heat oil in a large skillet. Cook garlic, oregano and paprika until fragrant (about 30 seconds). Add the sliced corn kernels and cook, stirring occasionally, until golden brown and beginning to pop (about three minutes). Add shrimp and stir or toss until cooked through (about four minutes). This one’s a keeper. Next time, I’ll add a little fresh roasted chopped green chile to the grits just to take the heat up a click! Serve shrimp and corn over grits and sprinkle with chives. It’s hard to beat shrimp and grits for supper. In my case, it’s hard to beat grits or polenta with just about anything. 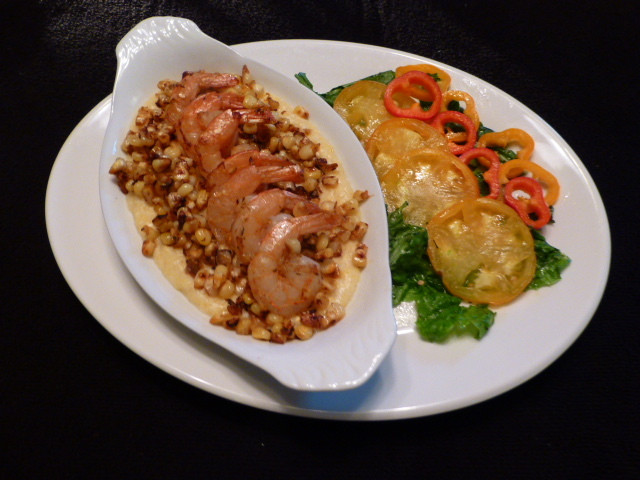 I was delighted to find a recipe for shrimp and grits that adds fresh corn with both the grits and the shrimp. Grate the kernels on the coarse side of a box grater. Watch your finger tips! 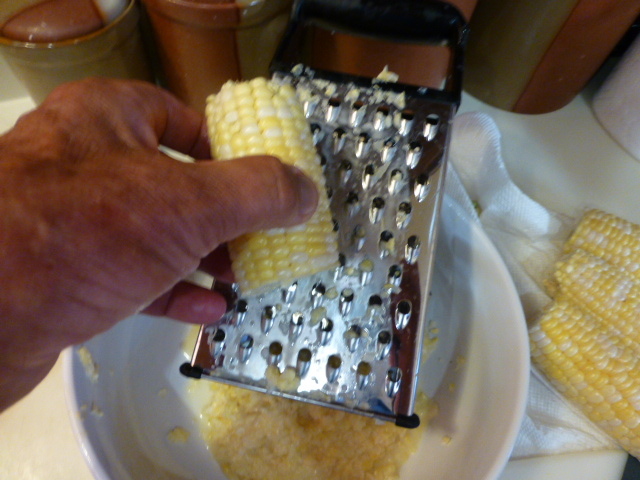 Start by grating the kernels from two ears of fresh corn on the large holes of a box grater. Cook your grits in a mix of water, milk and chicken broth, stirring and stirring because you are using real grits, not the instant or quick variety. After about 15 minutes, add the the grated corn and some butter to the grits and lower temperature so the grits continue to cook. Keep an eye on the grits while you let the garlic, paprika and oregano bloom in hot oil. 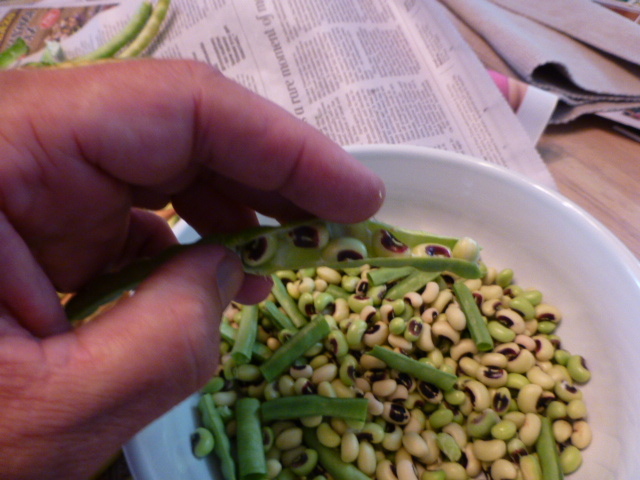 Add kernels sliced from a third ear of corn and let them get some color – about 4 minutes. 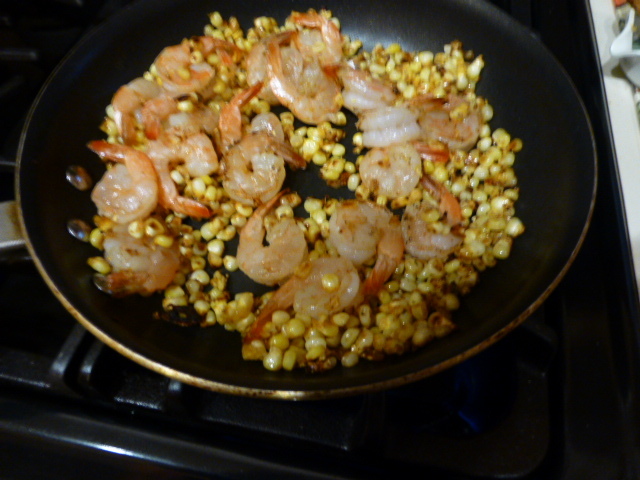 Add shrimp and toss or stir until tails curl and they turn pink on both sides. Corn roasting and shrimp cooking while the grits finish cooking. Plate the grits and shrimp, sprinkle on chopped chives and serve with a simple side salad. Fresh corn cooked in the grits and pan roasted with the shrimp make it very special. The side salad was romaine, yellow tomatoes and sliced baby sweet peppers with a vinaigrette. 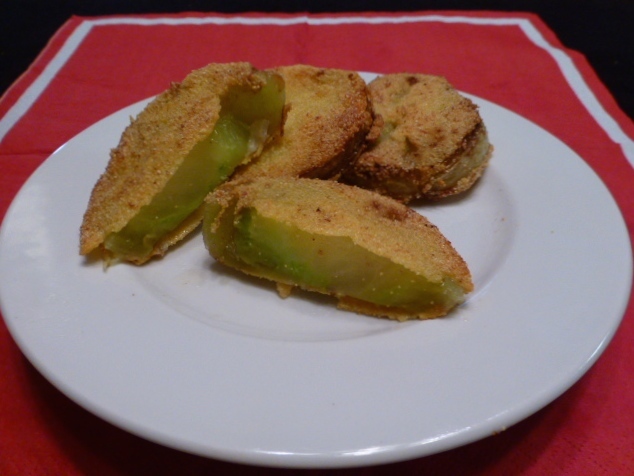 Find the Bon Appetit recipe under Recipes in the blog Menu. You probably have noticed that I grill a lot. 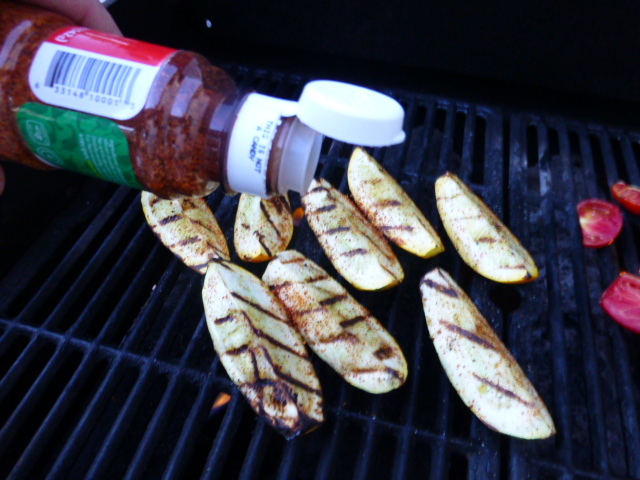 I love the flavor grilling gives meats and vegetables and even fruits! And I enjoy not heating up the kitchen and not having so much clean up after dinner. In the summertime, farmer’s market produce makes grilling even better. Last night, it was quartered squash and tomatoes with a sprinkling of Tajin chili lime powder. 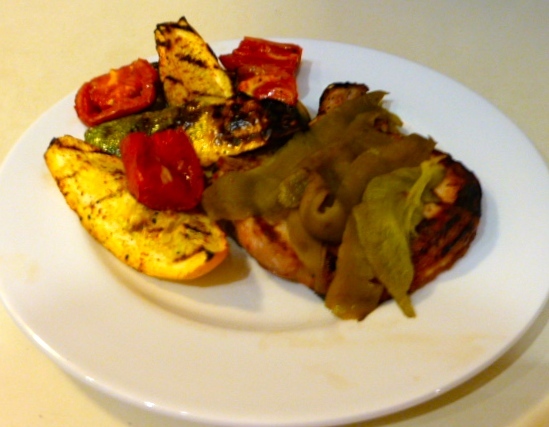 With the veggies, I served a grilled pork chop topped with freshly roasted green chiles. Good eats at dusk at the Doublewide. 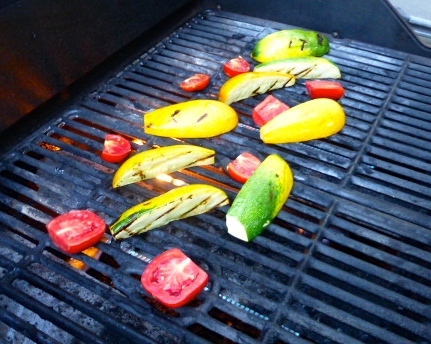 Squash and ‘maters on the grill. Plated with a grilled pork shop topped by fresh roasted green chile. It’s time to get back in the kitchen and lighten up a bit. We had a great three week visit from our friend Dave from Australia. We went on a quest for the best green chile cheese burger which took us from the first Blake’s Lotaburger store in Texas to the Buckhorn Saloon in San Antonio, New Mexico. Of course we had to go to Sparky’s in Hatch and to many other local sites. The Aussie is a very good chile eater! He also discovered Fritos corn chips and will miss them greatly at home in Oz. All those burgers came at a price – tighter beltlines and stretched buttons on shirts. So, now it is time to get back on the virtue wagon and be a little more conservative in our diet. We’ll be enjoying more fresh vegetables from the farmer’s market and more poultry and fish than we have for the past few weeks. Here’s a treat that comes in under 300 calories (for the chicken) but looks and tastes like a lot more. Chicken saltimbocca. Chicken breast, and the tender, with fresh sage leaves from the garden wrapped in prosciutto and sautéed in just two teaspoons of olive oil until the chicken is done and the prosciutto is crisp and translucent. A a drizzle of pan sauce – 1/4 cup fresh lemon juice, 1/3 cup low sodium chicken broth and 1/2 tsp corn starch, simmered and thickened – makes a perfect mildly tart compliment to the slightly salty prosciutto and savory sage of the chicken. On the side, fresh green beans, tiny blue and red skinned potatoes with lardon were a great addition to the plate. I can’t call this diet food, but I can say it is light and delicious! Sage leaves are visible beneath the translucent prosciutto which goes bright red when sautéed. 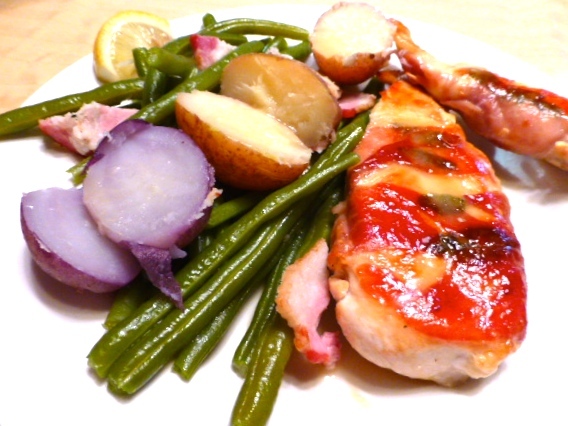 Green beans, lardon, blue and red skinned potatoes compliment the chicken saltimbocca. Friend Dave is visiting from Australia. In addition to his researching the best green chile cheese burger in the region, we decided to validate my cooking of a beetroot burger recipe from Anne Holohan. I’ve posted the burgers before, using both canned beets and home roasted beets. My personal preference is for the home roasted version. 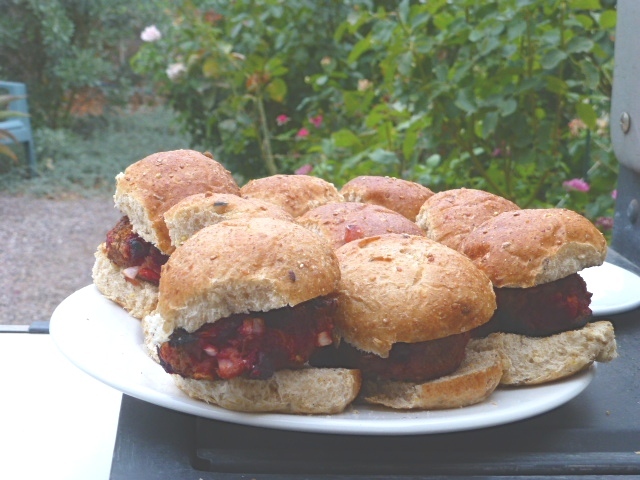 For this tasting, I chose to make beetroot burger sliders. 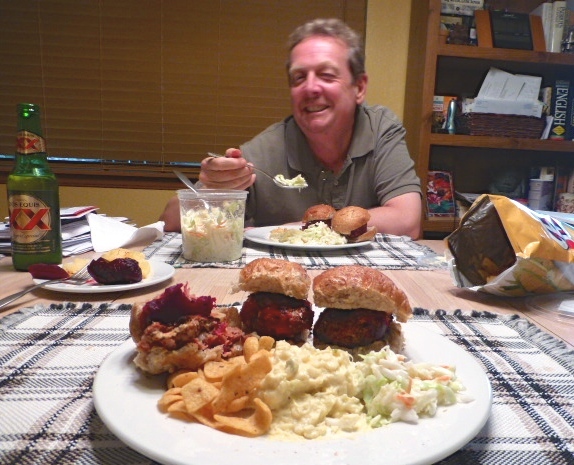 The patties were hamburger mixed with diced roasted beets, diced tomato, chopped onion, a beaten egg and bread crumbs. I used multi grain dinner rolls as buns. 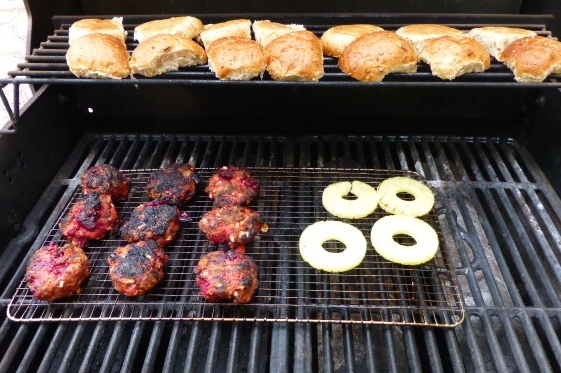 I also grilled pineapple slices to add to the burgers with additional beet slices. Beetroot in the patties caramelized quickly, so, when I flipped the patties, I turned off two burners and let them finish with indirect heat. Since first beginning to experiment with beetroot burgers, I’ve been amazed at how very good they are. Dave’s suggestion of adding grilled pineapple was an extra sweet treat on the sandwich! I served sliders in groups of three. Here are three servings on toasted rolls ready to go to the table. I served deli cole slaw and potato salad on the side and Fritos corn chips. Fritos are a new experience for Aussie Dave and I think he’s hooked on them now. He rated the beetrootburgers at 8 on a scale of 1 – 10. I think it was because a didn’t add a fried egg to the burgers as they would have been served in Australia. He didn’t seem to mind polishing off his sliders, anyway. I could always say the rating was because Dave helped roast the beets, but that would be tacky. Maybe an egg next time on a full size burger. These pancakes are a house treat. 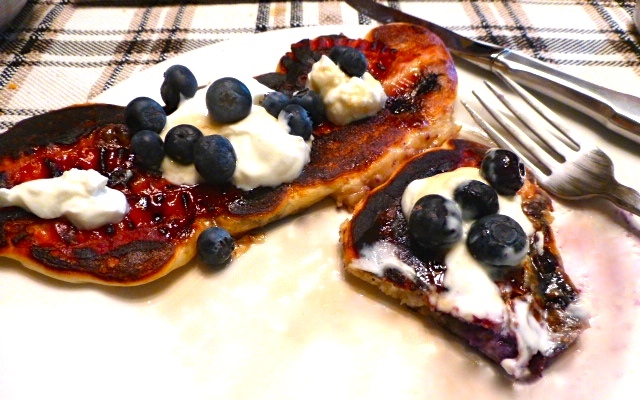 A strip of ready to eat bacon covered with blueberry pancake batter. 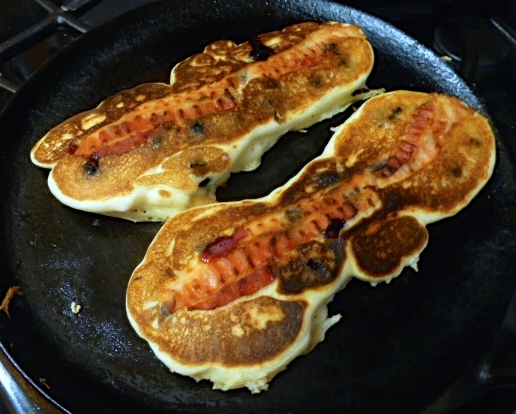 The bacon reminds me of tire tracks, hence the name Roadkill Pancakes. Roadkills pancakes finishing off on my cast iron griddle. Can you see the bacon tire tracks? Topped with Greek yogurt, maple syrup and a sprinkle of fresh blueberries, I had to have a couple of bites before shooting the plated picture. No breakfast leftovers this morning! What a good way to start Independence Day! Celebrate our freedom. Be grateful you are here. Remember our Armed Forces and what they do to keep us free.